In postmenopausal women with documented heart disease (n = 2,763, average age 66.7 years) a controlled clinical trial of secondary prevention of cardiovascular disease (Heart and Estrogen/Progestin Replacement Study; HERS) treatment with CE/MPA (0.625 mg/2.5 mg per day) demonstrated no cardiovascular benefit. During an average follow-up of 4.1 years, treatment with CE/MPA did not reduce the overall rate of CHD events in postmenopausal women with established coronary heart disease. There were more CHD events in the CE/MPA-treated group than in the placebo group in year 1, but not during the subsequent years. Two thousand three hundred and twenty-one women from the original HERS trial agreed to participate in an open-label extension of HERS, HERS II. Average follow-up in HERS II was an additional 2.7 years, for a total of 6.8 years overall. Rates of CHD events were comparable among women in the CE/MPA group and the placebo group in HERS, HERS II, and overall. In the CE/MPA substudy, 26% of the women reported prior use of estrogen-alone and/or estrogen/progestin combination hormone therapy. After a mean follow-up of 5.6 years during the clinical trial, the overall relative risk of invasive breast cancer was 1.24 (95% confidence interval 1.01â€“1.54), and the overall absolute risk was 41 vs. 33 cases per 10,000 women-years, for CE/MPA compared with placebo. Among women who reported prior use of hormone therapy, the relative risk of invasive breast cancer was 1.86, and the absolute risk was 46 vs. 25 cases per 10,000 women-years, for CE/MPA compared with placebo. Among women who reported no prior use of hormone therapy, the relative risk of invasive breast cancer was 1.09, and the absolute risk was 40 vs. 36 cases per 10,000 women-years for CE/MPA compared with placebo. In the same substudy, invasive breast cancers were larger and diagnosed at a more advanced stage in the CE/MPA group compared with the placebo group. Metastatic disease was rare with no apparent difference between the two groups. Other prognostic factors such as histologic subtype, grade and hormone receptor status did not differ between groups. 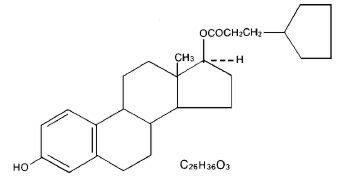 5 mg estradiol cypionate; also 5.4 mg chlorobutanol anhydrous (chloral deriv.) added as preservative; in 913 mg cottonseed oilâ€” in 5 mL vials, NDC 54868-1729-0. 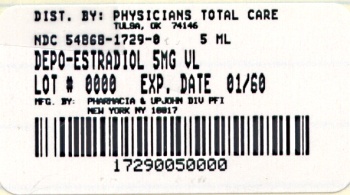 The text of the patient insert for estrogen-containing drug products is set forth below. This leaflet provides a summary of the most important information about DEPO-Estradiol. If you would like more information, talk with your healthcare provider or pharmacist. You can ask for information about DEPO-Estradiol that is written for health professionals. You can get more information by calling the toll free number 1-888-691-6813. You are cautioned to discuss very carefully with your doctor or healthcare provider all the possible risks and benefits of long-term estrogen and progestin treatment as they affect you personally.